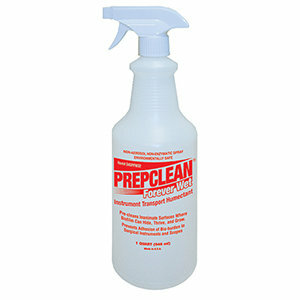 Instrument Transport Humectant Pre-Cleaner. Non-Enzymatic, Non-Aerosol. Helps to Prevent the Adhesion of Bio-burden to Surgical Instruments and Scopes. Prepclean® Forever Wet is a neutral pH, non-aerosol humectant spray which promotes the long lasting retention of moisture on soiled instruments helping to prevent the adhesion of bio-burden to surgical instruments and scopes. This unique formulation gently coats instruments to maintain moisture making it an ideal pre-cleaner for soiled instruments during transport or when left for an extended period of time. Perfect for use in Operating Theatres, Endoscopy Suites, Outpatient Surgery, Dental and other departments where instruments are transported to decontamination.